Warning – It can be super addictive.If you have no self raising flour than pls dont make it or ask me alternative as I dont know. The way I made it I m giving details. 8- 2 tbsp self raising flour. 1- Grind all to fine paste.check if it is lumpy or thick add little more milk to make semi thick n thin consistency. 2- Now take a big non stick tava n grease it with butter or desi ghee,put on lowest flame n pour half batter on it n with flattened bowl(katori) spread it round round n thinnest possible. 3- Let the flame remain lowest.Sprinkle desi ghee on it very lightly. 4- After two minutes start scrapping from corners n when u see light brown latches than turn it upside down n after 1-2 minutes it is ready. 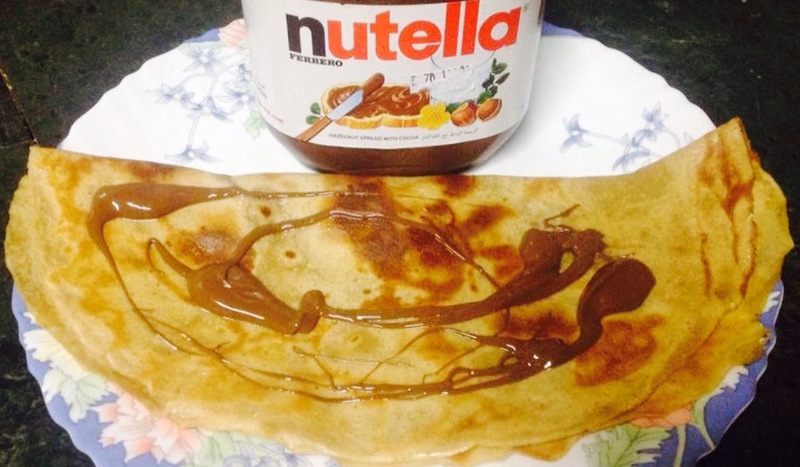 5- Now spread Nutella on it n eat it warm.